Now I know this post isn't at all related to cosmetics, but I just had to tell everyone about a fabulous shop I've ordered from on Etsy. It's called Divine Stampings and it's run by a lovely lady called Mary. She hand-craft's the most amazing silver necklaces and such and as the proud owner of one I can't stop rambling on about how gorgeous and well made they are. I bought a lovely necklace to commemorate mine and my other half's fifth anniversary this year (for two 20 year old's it's not bad is it) and I was beyond thrilled with the creation. 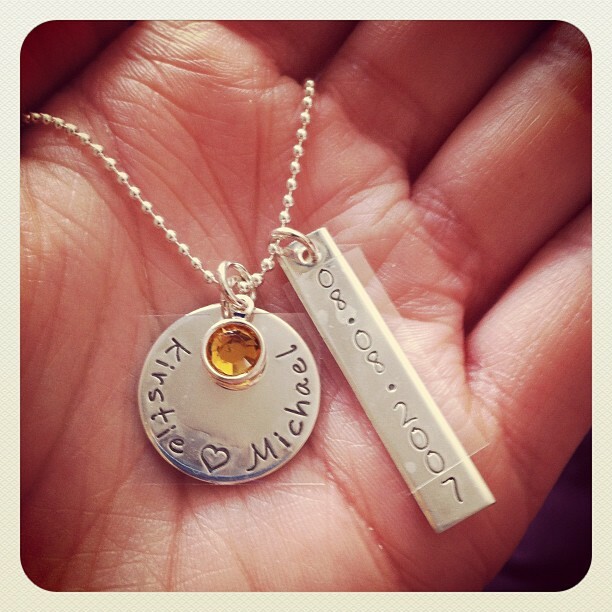 From what I've seen she can adapt the designs in her store to suit any personal requests; for example in my design you could change the little charm (I know you can request different birthstones in different finishes as well as pearls from what I can remember), the names and the date. You can also purchase different chains and priority shipping (though from my experience unless it's near a busy period such as Christmas you probably wouldn't need it as she seemed to work on mine really quickly) so you can make a piece which is truly personal. She does so many other designs that you can create and find one suitable for any occasion. They'd make great Mothers day; Christmas and birthday gifts and there are so many things which can be adjusted to suit that it would be difficult to go far wrong with them. I think a huge positive about this is that they are relatively inexpensive, especially given the fact that they are made to your exact specifications. Mine cost me around £33 pounds and for the quality and detail it's practically a bargain. I think everyone looking for that special gift should check the store out and see what you think. Have any of you purchased from Divine Stampings before or are wanting to? I'd love to hear from you all.